My week began with a very special botanical field trip to Sierra Madre, a hamlet near Pasadena that each year celebrates its hometown hero on the second Sunday of March. That hero is a 116-year-old plant. Isn’t that cool? Invited by Paula Panich, who enticed me with promises that I would see “one of the seven horticultural wonders of the world” (seriously, who could resist that offer!? ), I drove 60 miles east to Sierra Madre and joined Paula’s entourage. 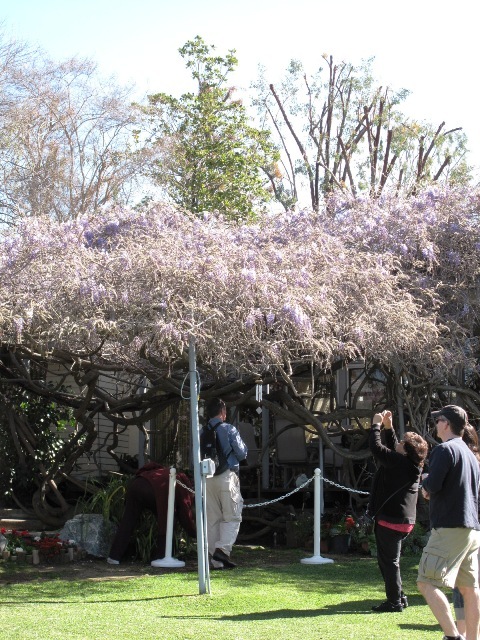 The Sierra Madre Wistaria Festival, a full-blown, main-street celebration, was under way to celebrate what the Guinness Book of World Records has named the world’s largest blooming plant – a Chinese wisteria (Wisteria sinensis). 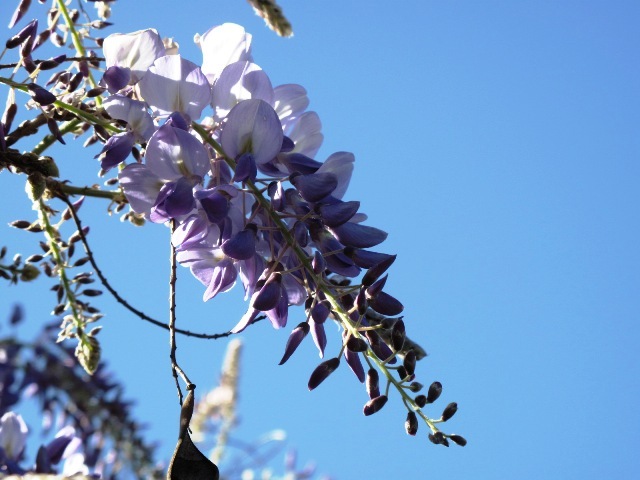 Said wisteria, which the locals more accurately call Wistaria*, was planted in 1894 by Alice Brugman. She rode by horse and buggy to the R.H. Wilson Pioneer Nursery in nearby Monrovia to purchase the vine in a one gallon pot, spending 75-cents. It now covers nearly one acre, weighs over 250 tons, and produces more than 1.5 million blossoms during a glorious, five-week run each spring. 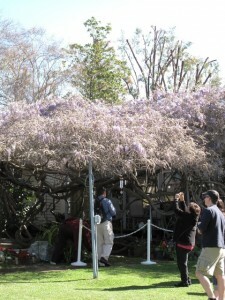 The festival occurs for one day only, when the property’s owners (aka the “flower stewards”) open up their gardens for thousands of visitors. We were in attendance a little early in the vine’s bloom cycle, as you can see. But still, it was a sight to behold! The vine covers two private residential gardens and is supported by a sturdy matrix of metal arbors. 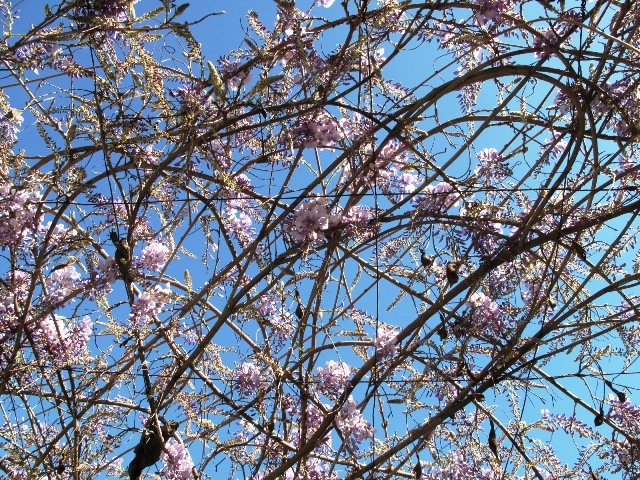 We walked underneath the canopy formed by lightly-scented, pale purple clusters that looked gorgeous against the intense-blue sky. Spring is here! The poppies are in bloom! This being perhaps my last spring as a full-time resident of Southern California, I was eager to squeeze in a visit to the Antelope Valley Poppy Reserve. My goal was to see the valley’s meadows and rolling hills awash in vibrant orange – a celebration of the California Poppy, the State Flower since 1903. While poppies grow in many areas, along the edges of highways and in surprising pockets both urban and rural, the only remaining large fields are in the western Antelope Valley. This area is part of northern Los Angeles Co., about 90 minutes northeast of my home in Thousand Oaks. My parents were en route to visit this weekend (from the Phoenix area) and so I convinced them to take the detour north off of Hwy. 14 to meet me for a Friday morning Poppy Adventure. We arrived at the 1,800-acre reserve located about 15 miles west of the town of Lancaster. As with my wisteria visit, we were definitely too early for the peak poppy bloom. 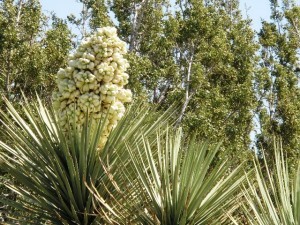 Despite plenty of spring precipitation, the temperatures here had not warmed up enough to prompt massive blooms. 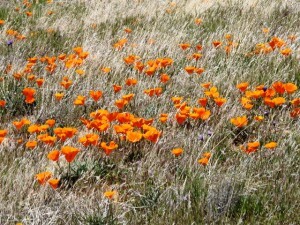 There were beautiful patches of orange poppies, intermixed with other lovely wildflowers – including blue lupines. We took joy in what we saw and promised ourselves to return in the future. I wish I could go back in two week’s time – that’s when the display will be the showiest! 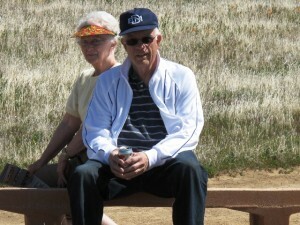 The park is named for Arthur Ripley, a farmer who willed the acreage to California when he died in 1988. 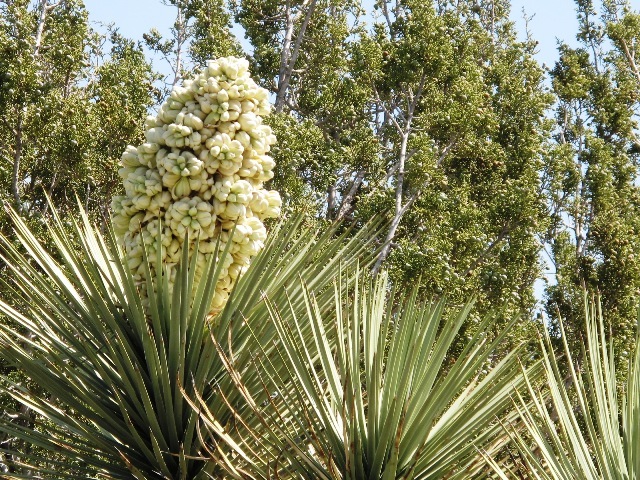 He farmed a large amount of land in Antelope Valley, but he also was concerned enough about the Joshua/juniper woodlands to preserve a pristine area. I was quite moved by this wild place. Walking through this desert woodland was pretty awe-inspiring. To find it, drive on Lancaster Road, heading west, about 5 miles beyond the Poppy Reserve. This entry was posted on Saturday, March 20th, 2010 at 1:37 am	and is filed under Gardening, General, Plants. You can follow any responses to this entry through the RSS 2.0 feed. You can leave a response, or trackback from your own site. Those are horticultural wonders. I’m thinking about what kind of structures must be holding up that wisteria and who had the foresight not to just whack it back way back when? Impressive, incredible. Whoa!!! That Wisteria is amazing. Great pictures! .-= Megan´s last blog ..Kicking it in Colma =-.